10 papers published on The Square Magazine from 1996 through 2006 to celebrate the 10 years of PS Review of Freemasonry. This project is sponsored by Lewis Masonic, the leading Masonic publisher since 1886. The Illustrated London News, 1865. THE ceremony of laying the foundation stone of the new Masonic temple at Shanghai took place on the 3rd of July -the Worthy Brother Robert Freke Gould, PM Nos. 178,580 and 743, PProvSGW Andalusia, officiating with the silver trowel. The lodges having mustered at the old Masonic Hall in the Canton Road, were marshalled in procession by the RW Bro Donaldson, the procession being headed by the consular body, the municipal council, the Customhouse officials, the Shanghai Rangers and rifle volunteers and the police band. The lodges so represented in the procession were the Ancient Landmark, Cosmopolitan, Tuscan, Northern Lodge of China, and the Royal Sussex. The band of the 67th Regiment came next. Then followed the stewards and others with the corn, wine, oil, book of constitutions, volume of the sacred law, mallet, Corinthian, Doric and Ionic lights, and other symbols of their architectural religion. When the procession reached the site shown in our illustration (from a photograph by Mr W. Saunders) a prayer was offered and a parchment scroll, bearing record of the date of this ceremony, a phial containing the current coins of England, India, China and Japan, the latest issues of the Anglo-Chinese newspapers, and lodge by-laws were placed between the upper and lower stones; the cement spread by Brother Gould. The PGM then called for three hearty cheers, which were given with enthusiasm while the band played a lively air. Two verses of the looth Psalm were sung, after which brief addresses were read by the Grand Master and Chaplain. During the ceremony the balconies of Messrs. Pustan and Co's hong (sic) were crowded with ladies, who had the opportunity of witnessing one of the most interesting and important Masonic rites. The building, as designed by architect Brother Clark, will consist of two parts, of which the front portion, facing the bund (sic), will contain three stories; while the back which will comprise a public hall on the lower floor and the Masonic temple above, will be two stories in height. 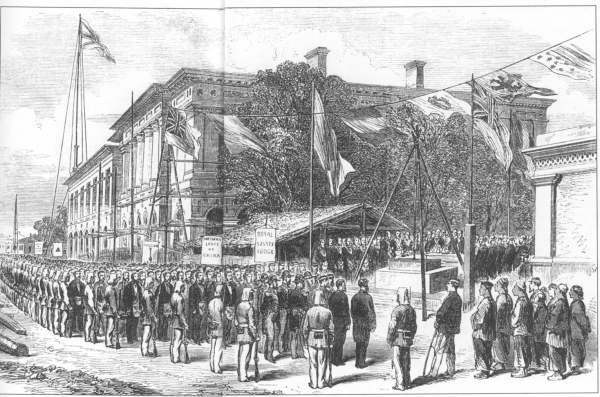 The public hall will be available for banquets, lectures, concerts and other public occasions, furnished with two entrances: one public, the other Masonic. The hall will be 25ft in height, the temple more so. There will also be servants' offices, library, reading rooms and refreshment room, Masters' conclave and Royal Arch Chapter. The style will be Italian.